Pranayama Yoga Pro is a clean and flexible premium WordPress theme for yoga teachers, yoga studios, spas, or any fitness related business. With this theme, you can create a rejuvenating and uncluttered website that gives a pranayama experience to your visitors. Pranayama Yoga Pro is a clean and flexible premium WordPress theme for yoga teachers, yoga studios, spas, or any fitness related business. With this theme, you can create a rejuvenating and uncluttered website that gives a pranayama experience to your visitors. This elegant theme is easy to use and has features that help you create a sleek website in no time. Also, mobile-friendly design and SEO optimization of the theme gives you an edge over your competitors. You want a WordPress website to grow your business. You are looking for a neat and user experience focused website template for promoting your yoga studio, fitness studio, gym, or health club. You are a yoga instructor, fitness blogger, personal trainer, yoga studio owner, health studio owner, gym owner, or fitness and sports enthusiast. You are looking for an intuitive layout and easy to use platform for your studio’s online presence. You don’t have the budget for hiring a developer but want to create a website to outmatch your competitors. You need a fast, friendly, and reliable support when you need assistance. You are an agency or a freelancer looking to build an SEO friendly and responsive website for your client. 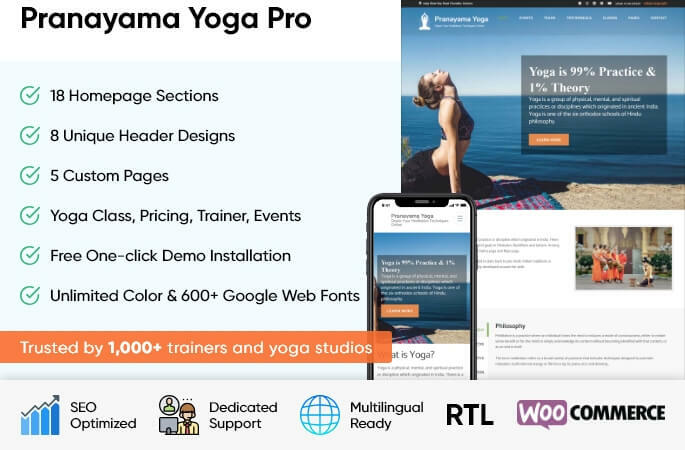 You can import all the images, text, and settings from the live demo of Pranayama Yoga Pro theme with a click for free because we believe you should spend more time on your business than on setting up your website. It is very important to have a website that displays correctly and is easy to use on small screen devices like smartphones and tablets. In fact, more than 50% of all the Google searches are made on mobile phones, and Google has made mobile-friendliness an important SEO factor. So, with Pranayama Pro WordPress theme, you can quickly build a fully responsive mobile-friendly website that ranks higher in Google. The theme passes Google mobile-friendly test. Pranayama Yoga Pro features 8 varieties of headers that you can implement with a click. Making a unique website has never been this easy. Have a video that you think will help you promote your business? Place it easily on the banner section of your website. You can upload a video directly or embed it from Youtube. Pranayama Yoga Pro also allows you to use static image or advanced slider on the banner. There are 18 home page sections that can be reordered or hidden according to your requirements. Display and show only the section you want. If you want to run an online store, Pranayama Yoga Pro lets you show your products on the homepage so that you get sales quickly. You can promote and showcase your Instagram profile using the theme. Your recent Instagram photos are seamlessly displayed on your website. Pranayama Yoga Pro has 5 different custom page layouts which include classes listing page, contact page, events page, team listing page, and testimonial page. This will help you make your website organized and professional. You can easily change the color of the Pranayama Yoga Pro right from the live customizer. The theme allows you to change Background Color, Primary Color and Secondary Color. Pranayama Yoga Pro allows you to change the fonts size and type easily. You can choose from more than 600 Google fonts. Easily translate your site into various languages and create a multilingual site as the theme is compatible with Polylang WordPress plugin. The theme is WPML Plugin compatible. So you can translate your site into multiple languages and easily create a multi-language website. Pranayama Yoga Pro features a powerful and intuitive options panel that allows you to customize and configure your themes easily . Search engines will fall in love with Pranayama Yoga Pro. However, you don’t have to worry about that with Pranayama Yoga Pro WordPress theme because you can make your website load crazy fast with just a few clicks. In short, if you enable the performance metrics, you will get a WordPress website with unbeatable page download speed. The theme, with its speed, will help you keep your customers and gain new potential customers easily. Pranayama Yoga Pro allows you to display your social media links on your website so that your visitors can find you on social media. Social media on your website will also help you boost your business’ engagement. The theme also supports Russian and Chinese social media like OK, VK, Xing, and others. You can add unlimited social media on your website. Pranayama Yoga Pro comes with extensive theme documentation to help you setup your website. Just follow the step by step guidelines on the documentation and your website will be ready in no time. Pranayama Yoga Pro is WooCommerce Plugin ready. So you have got everything you need to start a powerful online store and manage it like a boss. The theme has built-in settings for displaying products. Choose from unlimited backgrounds including colors, patterns, and even upload your own background to truly customize your website according to your brand. Choose from any number of sidebars and populate theme with widgets to add tons of features to your site with a few clicks. Pranayama Yoga Pro is cross-browser compatible, which means the theme will work seamlessly on your favorite browser. 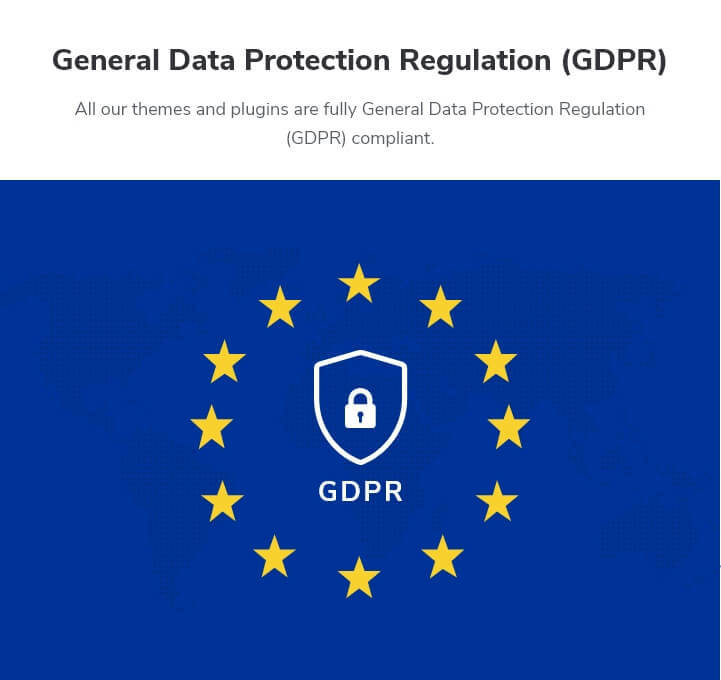 The theme is tested on Chrome, Firefox, Internet Explorer, Edge, and Safari. Pranayama Yoga Pro has a breadcrumb option that can help your visitors to navigate easily on your website so that there is maximum engagement. The text and design of the Pranayama Yoga Pro are optimized for readability with structured sizing, great contrast, and ample spacing. Don’t let the language barrier come between you and your website. Pranayama Yoga Pro theme supports localization so that you can use the theme in your local language. Do you use right-to-left (RTL) scripts like Arabic? Well, worry not! Pranayama Yoga Pro supports both LTR and RTL languages. You can write content with confidence! You can easily add your own logo on your website using Pranayama Yoga Pro theme. Want to modify some CSS effects or change color of a section? Pranayama Yoga Pro allows you to easily add CSS effects right from the customizer.